On June 14, 1777, the Second Continental Congress adopted the United States flag. We now know this day as Flag Day. Our country's flag has flown proudly since Revolutionary War. During this country's expansion across the continent, the flag flew. As the nation was torn apart by a civil war less than 90 years after its founding, the flag flew. During this country's defense of liberty in the two world wars, the flag flew. 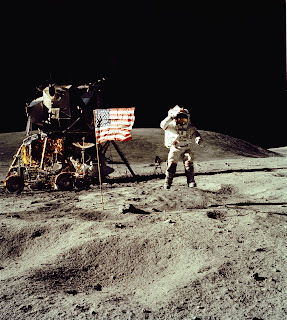 When man broke free of the earth and landed on the moon, the flag flew. When the rebuilding began after Islamic terrorists attacked this nation, the flag flew. When the people of Iraq were released from over 20 years of Saddam Hussein's oppression, the flag flew. And, despite those without our own country that seek to bring this country down, the flag still flies. Traditionally, the president issues a proclamation observing Flag Day, although the current occupant of the White House hasn't seen fit to do that this year; the last Flag Day proclamation on the White House's Website is from 2008. Despite the lack of recognition by the White House, we're encouraging you to show proper respect and allegiance to the flag of the United States, in accordance with the proper rules of etiquette. The flag represents this great nation. Fly it proudly. Oh, yes, one other thing. Two years before the flag was adopted, the Continental Army, forerunner of today's United States Army, was formed. That means today is the 235th birthday of the Army. If you see a soldier today, thank him. If you know a former soldier, thank him. I know he'd appreciate it.